Over the last four decades we have witnessed processes of dematerialization in various fields: with the dissolution of the gold standard, money has been dematerialized; with the ascendance of brand names, commodities; and by the emergence of movements such as Conceptual art, art practices. Taken together, these processes can serve as a starting point for rethinking materialism. Rather than render the concept of materialism obsolete, however, these extended developments force us to ask whether we can finally understand what materialism means. The evening will explore notions brought forward in Neomaterialism—the unreadymade, the dividual, the overqualified, the sciences of the age of privatization, capital’s technocratic fascism, and the social contract of gravity. The ideas in the book will be further investigated and discussed by writer and editor Federica Bueti, curator Julia Moritz, and artist Caleb Waldorf, together with Joshua Simon. An open conversation will follow. Describing and analyzing the changing meaning of matter, the book explores the relationship between symbols and matter. Since the so-called dematerialization of currencies and art practices in the late 1960s and early 1970, we have witnessed a move into what can be called an economy of neomaterialism, where our role is to absorb surpluses. With this, several shifts have occurred: the commodity has become the historical subject, the focus of labor has shifted from production to consumption, and symbols now behave like materials. 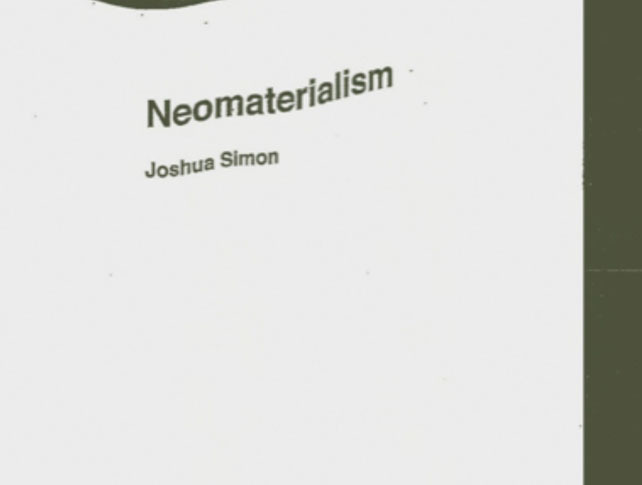 Neomaterialism explores the meaning of the world of commodities, and reintroduces various notions of dialectical materialism into the conversation on the subjectivity and vitalism of things. Reflecting on general intellect as labor and the subjugation of an overqualified generation to the neofeudal order of debt finance, Neomaterialism merges traditions of epic communism with the communism that is already here. Federica Bueti is a writer and art critic currently living in Berlin. She is founder and editor of …ment journal for contemporary culture, art, and politics. She is author of the novella Free Speech (Copy Press, forthcoming). Her articles and essays on art and social theory have appeared in various magazines (Art Agenda, FLUO, Art and Education, Flash Art, PerformaMagazine). Julia Moritz is an art historian and cultural theorist. She served as Head of Maybe Education and Public Programs atdOCUMENTA (13). The volume The Question of the Day (2007), coedited with Nicolaus Schafhausen, gives an insight into Moritz’s ongoing conversational inquiry into the conditions of production and reception of art. Caleb Waldorf is an artist living in Berlin. In 2007, he cofounded and is currently the creative director of the magazine Triple Canopy. His latest long-term collaboration was with the Museum of Modern Art’s C-MAP initiative on a platform called post, launched in early 2013.